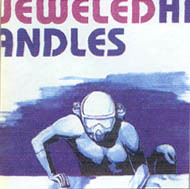 Sound clips from the Jeweled Handles CD are available in 2 different formats. You can download a high quality MP3 file, this will take awhile as the files are bigger...or, you can listen to a lower quality clip via streaming RealAudio (faster). To listen to MP3 files after you've downloaded them, we suggest using WinAmp, you can download it HERE for free. To listen to the RealAudio files, you must have RealPlayer, you can download it HERE for free.